Synovial fluid analysis is a group of tests that examine your joint (synovial) fluid. The tests help diagnose and treat joint-related problems. A sample of synovial fluid is needed for this test. Synovial fluid is normally a thick, straw-colored liquid found in small amounts in joints, bursae (fluid-filled sacs in the joints), and tendon sheaths. After the area is cleaned, the health care provider will insert a sterile needle through the skin and into the joint space. Once the needle is in the joint, fluid is drawn through it into a sterile syringe. Normally, no special preparation is needed. Tell your health care provider if you are taking blood thinners, because they can affect test results or your ability to take the test. Sometimes, the health care provider will first inject numbing medicine into the skin with a small needle, which will sting. 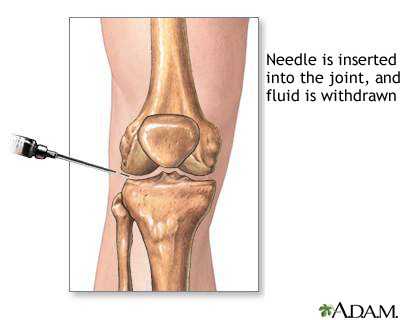 A larger needle will be used to draw out the joint fluid or synovial fluid. This test may also cause some pain if the tip of the needle touches bone. The procedure usually lasts less than 1 to 2 minutes. The test can help diagnose the cause of pain, redness, or swelling in joints. Sometimes, removing the fluid can also help relieve joint pain. Abnormal joint fluid may look cloudy or abnormally thick. Blood in the joint fluid may be a sign of injury inside the joint or a body-wide bleeding problem. An excess amount of normal synovial fluid can also be a sign of osteoarthritis. Ice or cold packs may be applied to the joint for 24 to 36 hours after the test to reduce the swelling and joint pain. Depending on the exact problem, you can probably resume your normal activities after the procedure. Talk to your health care provider to determine what activity is most appropriate for you. Orthopedic care often involves a team approach. Your team may include a doctor as well as a non-doctor specialist such as a physical therapist, as well as others. Orthopedic surgeons receive 5 or more extra years of training in the care of disorders of the bones, muscles, tendons, ligaments. Physical medicine and rehabilitation doctors have 4 or more extra years of training in this type of care after they graduated from medical school. They are also referred to as physiatrists. They do not perform surgery although they can give joint injections. Arthroscopy is surgery that is done using a tiny camera on the end of a tube to check for and treat joint problems. This procedure is typically done on the knee, hip, ankle, shoulder, elbow, or wrist. General anesthesia. You will be unconscious and unable to feel pain. Painkilling medicine. Your joint may be numbed, and you may be given medicines that relax you. You will stay awake. Spinal anesthesia. This is also called regional anesthesia. The painkilling medicine is injected into a space in your spine. You will be awake but will not be able to feel anything below your waist. The area is cleaned and a pressure band (tourniquet) may be applied to restrict blood flow. The health care provider will then make a surgical cut into the joint. Sterile fluid is passed through the joint space to expand the joint and provide a better view. Next, a tool called an arthroscope is inserted into the area. An arthroscope consists of a tiny tube, a lens, and a light source. It allows the surgeon to look for joint damage or disease. Images of the inside of the joint are displayed on a monitor. One or two other surgical cuts may be needed so the doctor can use other instruments to remove bits of cartilage or bone, take a tissue biopsy, or perform other minor surgery. In addition, ligament repairs can be done using the arthroscope. A number of different injuries and diseases may cause joint pain or problems. Remove the lining of the joint. This lining is called the synovium, and it may become swollen or inflamed from arthritis. After the procedure, the joint will probably be stiff and sore for a few days. Ice is commonly recommended after arthroscopy to help relieve swelling and pain. You can resume gentle activities, such as walking, immediately. However, using the joint too much may cause swelling and pain, and may increase the chance of injury. Do not restart normal activity for several days or longer. You may need to make arrangements for work and other responsibilities. Your doctor may also recommend physical therapy. Depending on your diagnosis, you may have other resrictions or need to do certain exercises. You will usually have an MRI scan of the joint done before surgery is planned. Always tell yoru doctor or nurse what drugs you are taking, even drugs, supplements, or herbs you bought without a prescription. You will be asked to stop taking drugs that make it harder for your blood to clot beginning 2 – 3 weeks before surgery. These drugs include aspirin, ibuprofen (Advil, Motrin), and naproxen (Naprosyn, Aleve). You will usually be asked not to eat or drink anything for 6 – 12 hours before the procedure. Always let your doctor know about any cold, flu, fever, herpes breakout, or other illness you may have before your surgery. You must sign a consent form. Make arrangements for transportation from the hospital after the procedure. Hypermobile joints are joints that move beyond their normal range of motion with little effort from the individual. Hypermobile joints are joints that move beyond the normal range with little effort. Joints most commonly affected are the elbows, wrists, fingers, and knees. Children are often more flexible than adults, but those with hypermobile joints can flex and extend their joints beyond what is considered normal. The movement is done without too much force and without discomfort. Children with hypermobile joints also often have flat feet. Hypermobile joints often occur in otherwise healthy and normal children. This is called benign hypermobility syndrome. There is no specific care for this condition. Persons with hypermobile joints have an increased risk for joint dislocation and other problems. Extra care may be needed to protect the joints. Ask your health care provider for recommendations. 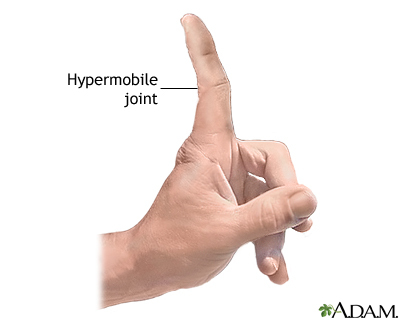 Hypermobile joints often accompany other symptoms that, taken together, define a specific syndrome or condition. A diagnosis is based on a family history, medical history, and a complete physical exam. Is it getting worse or more noticeable? Are there any other symptoms, such as swelling or redness around the joint? Is there any history of joint dislocation, difficulty walking, or difficulty using the arms? The physical exam will include detailed examination of the muscles and skeleton. The joints may be moved to determine the direction and extent of mobility. Further tests will depend on what condition is suspected. Joint pain can be caused by many types of injuries or conditions. No matter what causes it, joint pain can be very bothersome. Joint pain may also be caused by bursitis (inflammation of the bursae). The bursae are fluid-filled sacs that cushion and pad bony prominences, allowing muscles and tendons to move freely over the bone. Follow prescribed therapy in treating the underlying cause. For nonarthritis joint pain, both rest and exercise are important. Warm baths, massage, and stretching exercises should be used as frequently as possible. Anti-inflammatory medications may help relieve pain and swelling. Consult your health care provider before giving aspirin or NSAIDs such as ibuprofen to children. How long have you been having this pain? Have you had it before? Have you had an illness or fever? Does resting the joint reduce the pain or make it worse? Does moving the joint reduce the pain or make it worse? Are certain positions comfortable? Does keeping the joint elevated help? Do medications, massage, or applying heat reduce the pain? Are your joints stiff in the morning? If so, how long does the stiffness last? Physical therapy for muscle and joint rehabilitation may be recommended. A procedure called arthrocentesis may be needed to remove fluid from the sore joint. The test is done in a hospital radiology department or in the health care provider’s office. The x-ray technologist will help you position the joint to be x-rayed on the table. Once in place, pictures are taken. The joint may be repositioned for different views. Inform the health care provider if you are pregnant. Remove all jewelry. The x-ray is not uncomfortable, except possibly from positioning the area being x-rayed. The x-ray is used to detect fractures, tumors, or degenerative conditions of the joint. The x-ray may reveal arthritis, fractures, bone tumors, degenerative bone conditions, and osteomyelitis (inflammation of the bone caused by an infection). There is low radiation exposure. X-rays are monitored and regulated to provide the smallest amount of radiation exposure needed to produce the image. Most experts feel that the risk is low compared with the benefits. Pregnant women and children are more sensitive to the risks of the x-ray. Changes in posture and gait (walking pattern) are as universally associated with aging as changes in the skin and hair. Muscles provide the force and strength to move the body. Coordination is directed by the brain but is affected by changes in the muscles and joints. Changes in the muscles, joints, and bones affect the posture and gait, and lead to weakness and slowed movement. Bone mass or density is lost as people age, especially in women after menopause. The bones lose calcium and other minerals. The spine is made up of bones called vertebrae. Between each bone is a gel-like cushion (intervertebral disk). The trunk becomes shorter as the disks gradually lose fluid and become thinner. In addition, vertebrae lose some of their mineral content, making each bone thinner. The spinal column becomes curved and compressed (packed together). Bone spurs, caused by aging and overall use of the spine, may also form on the vertebrae. The long bones of the arms and legs, although more brittle because of mineral loss, do not change length. This makes the arms and legs look longer when compared with the shortened trunk. The joints become stiffer and less flexible. 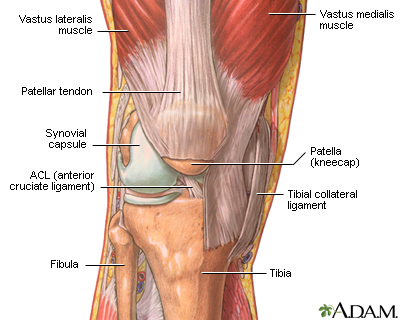 Fluid in the joints may decrease, and the cartilage may begin to rub together and erode. Minerals may deposit in and around some joints (calcification). 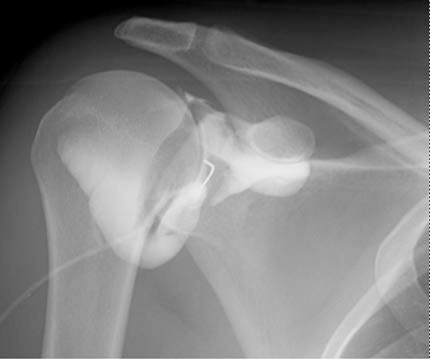 This is common in the shoulder. Hip and knee joints may begin to lose joint cartilage (degenerative changes). The finger joints lose cartilage and the bones thicken slightly. Finger joint changes are more common in women and may be hereditary. Some joints, such as the ankle, typically change very little with aging. Lean body mass decreases, caused in part by loss of muscle tissue (atrophy). The rate and extent of muscle changes seem to be genetically determined. Muscle changes often begin in the 20s in men and the 40s in women. Lipofuscin (an age-related pigment) and fat are deposited in muscle tissue. The muscle fibers shrink. Muscle tissue is replaced more slowly, and lost muscle tissue may be replaced with a tough fibrous tissue. This is most noticeable in the hands, which may appear thin and bony. Changes in the muscle tissue, combined with normal aging changes in the nervous system, cause muscles to have less tone and ability to contract. Muscles may become rigid with age and may lose tone, even with regular exercise. Bones become more brittle and may break more easily. Overall height decreases, mainly because of shortening of the trunk and spine. Inflammation, pain, stiffness, and deformity may result from breakdown of the joint structures. Almost all elderly people are affected by joint changes, ranging from minor stiffness to severe arthritis. The posture may become more stooped (bent) and the knees and hips more flexed. The neck may become tilted, and the shoulders may narrow while the pelvis becomes wider. Movement slows and may become limited. The walking pattern (gait) becomes slower and shorter. Walking may become unsteady, and there is less arm swinging. Older people become tired more easily, and have less energy. Strength and endurance change. Loss of muscle mass reduces strength. However, endurance may be enhanced somewhat by changes in the muscle fibers. Aging athletes with healthy hearts and lungs may find that performance improves in events that require endurance, and decreases in events that require short bursts of high-speed performance. Osteoporosis is a common problem, especially for older women. Bones break more easily, and compression fractures of the vertebrae can cause pain and reduce mobility. Muscle weakness contributes to fatigue, weakness, and reduced activity tolerance. Joint problems are extremely common. This may be anything from mild stiffness to debilitating arthritis (see osteoarthritis). Some elderly people have reduced reflexes. This is most often caused by changes in the muscles and tendons, rather than changes in the nerves. Decreased knee jerk or ankle jerk can occur. Some changes, such as a positive Babinski’s reflex, are not a normal part of aging. Involuntary movements (muscle tremors and fine movements called fasciculations) are more common in the elderly. Inactive or immobile elderly people may experience weakness or abnormal sensations (paresthesias). Muscle contractures may occur in people who are unable to move on their own or have their muscles stretched through exercise. Exercise is one of the best ways to slow or prevent problems with the muscles, joints, and bones. A moderate exercise program can help you maintain strength and flexibility. Exercise helps the bones stay strong. Consult with your health care provider before beginning a new exercise program. A well-balanced diet with adequate amounts of calcium is important. Women need to be especially careful to get enough calcium and vitamin D as they age. Postmenopausal women, and men over age 65, need 1,200 – 1,500 mg of calcium and 400 – 800 international units of vitamin D per day. If you have osteoporosis, talk to your doctor about prescription treatments. Limited range of motion is a reduction in the normal distance and direction through which a joint can move. Range of motion is the distance and direction of movement of a joint. Limited range of motion is a term meaning that a specific joint or body part cannot move through its normal range of motion. Motion may be limited by a mechanical problem within the joint, by swelling of tissue around the joint, by stiffness of the muscles, or by pain. Diseases that prevent a joint from fully extending may, over time, produce contracture deformities, causing permanent inability to extend the joint beyond a certain fixed position. Your health care provider may recommend range of motion exercises, designed to increase muscle strength and flexibility. Continue these exercises at home. Visit your health care provider if a joint does not move fully and easily in its normal way. If a joint develops (new) changes in its ability to move, the affected part should be examined to determine the cause. What body part is affected? Does the limited range of motion affect more than one body area? Do you also have pain? Note: Limited range of motion may be discovered by the health care provider during an examination for other conditions, and the affected person may or may not have been aware of its presence. The muscular system, nervous system, and skeleton may be examined in detail. Depending on the cause, joint x-rays and spine x-rays may be needed. Other tests may also be done. Physical therapy may be recommended. Joint swelling may occur along with joint pain. The swelling may cause the joint to appear larger or abnormally shaped. Joint swelling can cause pain or stiffness. After an injury, swelling of the joint may mean you have a broken bone or a tear in the muscle tendon or ligament. Many different types of arthritis may cause swelling, redness, or warmth around the joint. An infection in the joint can cause swelling, pain, and fever. If the joint swelling occurs after an injury, apply ice packs to reduce pain and swelling. Raise the swollen joint so that it is higher than your heart, if possible. For example, if your ankle is swollen, lay down with pillows comfortably placed underneath your foot so that your ankle and leg is slightly raised. For those with arthritis, your doctor’s treatment plan should be followed carefully. Call your health care provider immediately if you have joint pain and swelling with a fever. A joint is where two or more bones come together, like the knee, hip, elbow or shoulder. Joints can be damaged by many types of injuries or diseases. Arthritis or simply years of use may cause a joint to wear away. This can cause pain, stiffness and swelling. Over time, a swollen joint can become severely damaged. Treatment of joint problems depends on the cause. If you have a sports injury, treatment often begins with the RICE (Rest, Ice, Compression and Elevation) method to relieve pain, reduce swelling and speed healing. Other possible treatments include pain relievers, keeping the injured area from moving, rehabilitation, and sometimes surgery. For arthritis, injuries, or other diseases, you may need joint replacement surgery to remove the damaged joint and put in a new one.